From the peaks of its emerald mountains, through floral and fern banked streams, to its endless palm fringed shores, Kaua’i more than lives up to its name ‘The Garden Isle’. Nestled on its Eastern shore, Kaua’i Ranch is a pristine 4,300 acre jewel of exceptionally unique private land cascading down the central mountains to lush fields, rushing beyond to the boundless sea. The history of Kauai Ranch begins in 1854 when German immigrant Ernest Krull purchased a track of land at Kealia from King Kamehameha III. Within 7 years he began operating a dairy farm for the purpose of selling mainly hides, tallow, and butter in addition to beef and dairy products to Honolulu merchants and whaling ships. Krull eventually sold the land to sugar planters Captain James Makee and his son-in-law Colonel Zephaniah Spalding in 1876- land that would eventually become part of Makee Sugar Company. In 1876, King David Kalakaua, formed the Hui Kawaihau. The Hui was originally formed by the King’s younger brother, an accomplished musician, as a choral society. When his brother passed away, the King reorganized the hui into a business group. Their first order of business was to cultivate sugar cane on Kauai. Colonel Spalding and Captain Makee, members of the Hui Kawaihau, obtained approximately 11,000 acres of land near Kapa`a. With this land, they established eastern Kauai’s sugarcane industry and started the Makee Sugar Company. By 1881, Colonel Spalding bought Kalakaua’s share in the sugar company and by 1886 — having eventually purchased Makee’s one-third stake from his heirs — owned the company outright. At the same time he also started the Kealia Sugar Plantation. He was the first to utilize the night grinding technique and introduced the diffusion process for manufacturing the cane, as well as expanded the railroad system down to the mill located on Kealia beach. While no homes existed at Kaua’i Ranch’s present location, the lower makai Kealia was the heart of plantation’s operation and housing for its managers and workers. Ships came from all over the world into Kealia bay for loading and unloading their goods. The older rim plantation homes are all that exist today of these earlier structures. In 2000, the McCloskey family purchased Kaua’i Ranch, consisting of the entire 6500 acre ahupua’a, from the Lihue Plantation Company. 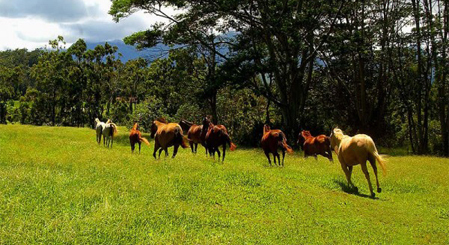 Today Kauai Ranch operates as a private family/working cattle ranch, a full service nursery, and is also contracted as a premier location for filming and photo shoots with its unrivaled scenery and remote feel yet easy access. 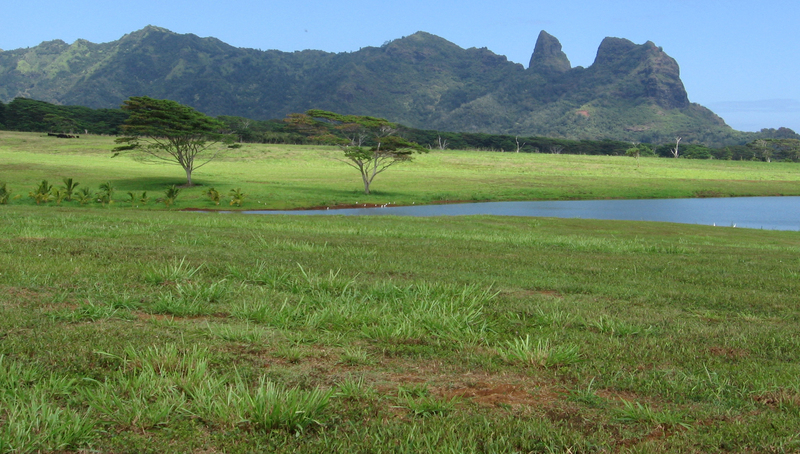 Kauai Ranch is an exceptional piece of land in an extraordinary setting.